Photo of Germantown settlement ruins. The German population of Louisiana has always extended well beyond the New Orleans area, and this fact is not unrepresented in THNOC’s materials. In fact, Hanno Deiler’s outreach to Germans considering coming to America not only attempted to interest them in New Orleans, but was directed also at farmers, and highlighted the agricultural opportunities presented by Louisiana’s fertile environment. The German Study File at THNOC includes substantial information on two German settlements in rural Louisiana with unique and compelling histories. 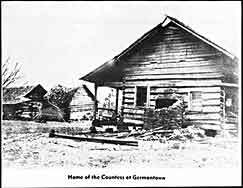 Germantown, just outside of Minden in north-central Louisiana, was founded in 1834 by the followers of a charismatic dissenter from The Harmony Society known alternately as Maximilian Count von Leon, Bernard Müller, and Proli. Germantown was one of a number of experiments in communal living in mid-nineteenth century America and was quite successful for some time. Descendants of its members remain scattered around North Louisiana today. Many of the buildings of the community are still preserved on the site of the commune, as well. Robert’s Cove, formerly German Cove, is an Acadiana town with a decidedly German history. A unique, Swabian dialect of German was somehow preserved there and was spoken by most of the town’s residents until only one or two generations ago. Genealogical data concerning the town’s oldest families as well as correspondence between officials of the town and officials of their forefathers’ hometowns in Germany are in the file. German Study File. An extensive collection of research copies and working papers compiled by Dr. Ellen Merrill touches upon the entirety of German-Louisiana history. A notable component of the German Study File is the material on Germantown and Robert's Cove, Louisiana. This material, consisting mostly of copies and newspaper clippings, deals with an element of German history in Louisiana which is absent from the Deutsches Haus Archives, the Germania Lodge materials, or any of THNOC's other German-related manuscripts holdings. Joseph Pennell Letter from Germantown. MSS 63. 1 item. Pennell was an American illustrator, printer, author, and teacher; created New Orleans– and Louisiana-related images for Century Magazine and books by George Washington Cable; Married Elizabeth Robins Pennell (1855–1936); friends with Am. artist James Whistler. Letter has a dateline of Germantown, 23 December, 1883, and is written to J. B. Pond, Esq., concerning the proposed meeting of a Mr. Williams with Mr. [George Washington] Cable, and asking about Mr. Cable's giving readings in Philadelphia. Deutsch Book. Germantown (Minden, LA). 82-104-L. 2 reels. Book of home remedies and German folk wisdom from the colony at Germantown. Translations can be found in the German Study File. HNOC Germantown Records. Home of the Countess at Germantown. Anonymous photograph in halftone of a wooden cabin in ruins. Photoprint made between 1950 and 1973. Acc. No. 1974.25.31.63. Ruins of Germantown settlement in Louisiana in 1920s. Anonymous copy photograph made between 1950 and 1973. Acc. No. 1974.25.31.64.T051202.0874.2. McCord, Stanley Joe. A historical and linguistic study of the German settlement at Roberts Cove, Louisiana. [N.p. ]: 1969. 22 cm. LC: F380 G3/M3. Arndt, Karl J. R., ed. George Rapp's Separatists, 1700–1803: The German prelude to Rapp's American Harmony Society: a documentary history. (Georg Rapps Separatisten, 1700–1803: die deutsche Vorgeschichte von Rapps amerikanischer Harmonie-Gesellschaft. Worcester [MA]: Harmony Society Press, 1980. 24 cm. LC: HX656.H2/G46. Kondert, Reinhart. From Geilenkirchen to Acadia Parish: A history of the Germans of Roberts Cove, 1880–1987 / by Reinhart Kondert; with genealogical materials by Fr. Charles Zaunbrecher; foreword by Fr. Keith L. Vincent. Lafayette: Center for Louisiana Studies, University of Southwestern Louisiana, 1988. 23 cm. LC: F379 R6/K6 1988. Krouse, Rita Moore. Fragments of a Dream: The story of Germantown. Ruston: Leader Press, 1962. 99-178-RL.4. Low German: Platt in America. Unaccessioned. WRC Vertical Files Collection.